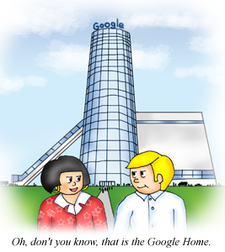 The "Google Home" may not look like this building, but they sure have enough assets to build an even bigger and better one! Google's recent profits topped expectations, but this is in contrast to the privately held SixApart who owns the blogging software that I do this blog on, TypePad. If you look at what they charge per year for TypePad's services, you can discern that their profits don't come anywhere near to Google's (even with a potential million customers). What they have in common is that they both help bring buyers and sellers together, in my opinion. I actually visited SixApart's home office in San Francisco in August, 2005. It was nice with a downtown "brick and open ceiling" look. However, I'm sure that SixApart has not had the advertising profit that Google has had. My point is that if you read SixApart's history, you'll see they've come a long way since the Fall of 2001. Their growth has accelerated in the last year, and to quote one of the founder's "we see activity on the service-both reading & writing-that equals services with 100 times the number of users on TypePad." Are Bloggers "Publishers" or "Common Carriers" Regarding "Comments"? This post is a follow-up to my "Is A Blogger A 'Carrier' or 'Editor' of Blog Comments" post. 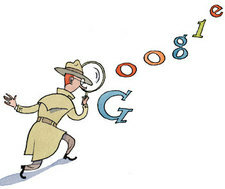 The cartoon represents an attorney-detective using Google to find information that will help substantiate their side of the buyer-seller blogging, Federal District Court Issue currently in progress. The importance of this case, in my opinion, is reinforced by the 10/17/& 18/05 BlogOn2005 Conference just completed as more and more sellers use the social media of blogs for "Buzz Marketing". Hopefully, buyers will also use them to help find ethical and value driven sellers. But, the issues in this case can get complicated (will need detective-legal research work), as Ian McAnerin seemed to do in his latest blog post on the subject. Is A Blogger A "Carrier" or "Editor" of Blog "Comments"? I've always respected Ian McAnerin for his "ethical stance" posts on Search Engine Watch Forum. He has a law degree, but never practiced law according to what he openly tells us. He is, however, an experienced search marketer (SEO-SEM), and a founding member of the SMA-NA (Search Marketing Association of North America). His blog (McAnerin's Manic Meanderings) has a 9/21/05 post entitled "Traffic Power Lawsuit, Blogging, and the SMA-NA" that concerns a buyer-seller blogging Federal District Court issue that can affect all bloggers. That is, are bloggers responsible for the comments posted by other people on their blog? In reading that post, Ian says: "In general, the existence of a particular comment in a blog does not mean that the owner exercised editorial control over it being there,..." He goes on to say: "In short, the blogger usually acts as a "carrier" rather than a "publisher" or "editor" of blog comments. The normal assumption is that people are responsible for their own comments, not the owner." Ian then says: "The Traffic Power suit goes against this idea and basically attempts to treat blogs as newspapers that edit and exercise control over their writers and content. Anyone who has been a victim of blog spam knows that's nonsense." I was going to do a post on spam blogs, but too many good authors beat me to the punch! After going to Bloogle (Google Blog Search) to see how many results I could get for the keywords "spam blogs" (in quotes) = 1,161 (re-checked on 10/18/05), I decided it would only add to the saturation. I am usually against "saturation" as I elaborated in my "Saturation, Clutter & Intrusiveness" post recently, but when it comes to raising awareness and exposing "RSS = Really Simple Stealing" in the blogosphere, I'm hoping that demand will always exceed supply for both buyer's & seller's sake. I particularly enjoyed reading "Content Theft, Copyright & Plagiarism in the Blogosphere" by Martin. Buyers and sellers both should do blogs, in my opinion. Buyers could put all kinds of requirements, specifications, and general parameters along with the specific RFP's (aka "RFQ's") posted in their blogs. They could have their blog "password protected" or not, and require authentication of the people responding to the posted RFP's or Q's. Depending upon what the buyer is buying, it could be a way of saving the time costs of individually contacting many suppliers, and getting the best overall value on the purchase. Even the U.S. Gov't uses the internet to publish RFQ's on their e-Buy. Seth Godin's free new ebook called "WHO's THERE?" is great for new bloggers whether they be buyers or sellers thinking of starting a blog. I liked his three truths to start off with: 1st: Clutter, 2nd: Quality, 3rd: Selfishness. I've even posted on "Saturation, Clutter, & Intrusiveness". "Bloogle" = Old Posts Start 6/05? While I'm not usually into promoting a nickname for something new, I did like B. L. Ochman's term for the new Google Blog Search called "Bloogle". Both buyers and sellers can take advantage of this new, fast technology to find good " inside blog conversation" information. Google's FAQ's say that for now the search engine spider crawling goes back to only 6/05, but more coming soon. My first post goes back to 7/18, and has not been indexed by Bloogle yet. Oh well, I can't complain, since I have 24 posts and 17 are showing on a Bloogle search for Brokerblogger. On top of that, Chris Sherman, Search Engine Watch Editor, named his new article about Bloogle "Google Launches Industrial Strength Blog Search". When my reps and I dealt with nothing but industrial strength companies for many years, how could I not like this title! I have mentioned in previous posts here that I believe in "O'HUG" Communication (Open, Honest, Upfront, and Good). My whole life, I have "threatened" to write a book on this, and how it affects every area of everybody's life. Someday, I will! Well, it is time to "wake up and smell the coffee" when it comes to what is happening in the blogosphere that, I believe, affects "buyers & sellers. While I was attending the blog session at the SES San Jose Conference on 8/9/05, Pete Blackshaw was publishing his ClickZ article on Protect the Marketing Commons. I missed this article even though I used another of Pete's articles entitled Attention? I Don't Want Your Freakin' Attention!in my recent The Holy Grail of Trust post. Both articles are great! This is my first post since 8/6/05. Things got hectic just before I left, but from now on, I will post that I am going on a combination vacation-business trip in keeping with my O'HUG (open, honest, upfront, and good) Communication Philosophy. Since I haven't started promoting this blog yet, I'm hoping it is a mute point for now. I left for the SES San Jose Conference on 8/7/05. I went to many blogging related sessions and learned a few tips like trying to keep my posts to 300 or so words or less according to Amanda Watlington (Blogs and Feeds). But, Greg Jarboe of SEO-PR's NEWS BLOG was a speaker at a couple of the sessions on blogs, also, who made an interesting comment. He believed that if everybody was doing short posts on blogs, maybe you should try longer than 300 word blog posts if you had valuable content that justified it. It is nice to see that he practices what he preaches in his own blog. His theory was related to the stock market as he tries to sell when others say buy, and buys when others say sell.